To Sid's family: I know it's a relief for all of you that you will no longer see him in agony - and, you know Sid's heart, and that he is now at peace. Your mourning began with his diagnosis four years ago. God bless each of you for coming together to keep the businesses and family matters going through those difficult times. What a wonderful family you are! We will keep you in prayer as you greet your family and friends tomorrow, and lay your hero to rest. Prayers for your Family Brother Sid we know you are in good hands! Go Rest high on that mountain my friend. We are so sorry to hear of Sid's passing. Rest in peace dear friend in the arms of our Dear Lord. So sorry Jordan. We will be praying for you and the family. Sid was such a gifted man. I used to enjoy bumping into him in the old days back in Va.
My condolences go out to all of Sid's family and friends. He made a lot of people happy with his wonderful musicianship. May he RIP. My condolences to his family. Gerry Hogan. Sid and I had been friends since he made his first apprearance at the ISGC, who knows how many years ago. I remember him burning it up with no finger picks. We will not forget you Sid. The entire Scott family is saddened to hear this news. His appearances at the ISGC were well remembered and we were happy to see him there. Our condolences to the entire Hudson family. RIP. Albert Tally has asked me express condolences from him and the Texas Steel Guitar Association. 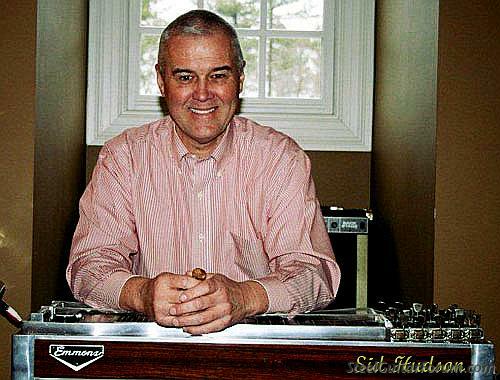 We considered Sid to be a great person, musician and friend of the TSGA. Thanks for the great memories. Our sincere condolences to Sid's family & friends from all of us here at Peterson. Sid was a great musician and we had the pleasure of speaking to him often over the years. - Celebrating 70 Years of Tuning Products in 2018! Very sad news. My condolences to Sid's family. Godspeed to Cousin Sid, my sincerest sympathies go to Jordan and the rest of Sid's family. Your dad was an amazing man, generous with knowledge and warm friendship. I shall miss him. I so sorry to hear about Sid. I was lucky to spend a little time with him he was a wonderful person and I had fun Playing some tunes with him. Sid you will be missed. I met Sid at the Dallas show with Billy Knowles. He played extremely well with no finger picks. He was a very nice man and treated me like we had known each other for years. I would often call him and chat from time to time. RIP Brother.....to his family, he was a good man who will be missed. Hi Jordon I want to tell you how Anna and I thought a lot of your Dad. He came to our Steel guitar Shows at the that we ran at the Golden Pawn shop in Clayton North Carolina and we also came to the first one he had in your area. I buy live Steel strings from Ray Thomas and I will not use any other strings they are the best on the market. Keep his Live Steel Strings going. I will never for get him. God bless him and your Family. So sad for us, but Sid has just inherited a home where he can play in the heavenly band.He will be missed. Great Guy.